The 2019 car show hosted by the Lake Country Classics Car Club is scheduled for Saturday October 19, 2019 with a rain date of Sunday October 20. This is a pre-registration only show limited to the first 75 registrations. The location is Governor Jim Hogg Park, Quitman TX. An additional 10 registrations will be allowed to fill possible cancellations. Early registrations may cancel their registrations prior to September 15, 2019 and their registration fee will be returned. Any entries not selected will also have their registration fee returned. As witnessed by our 2018 attendees all registrations attending will receive a great door prize, be elgible for cash drawings and be eligible for first or second place awards plus a free t-shirt. We attempt to set the standard for quality and excellence plus host a fun car show for all participants. Registration fee is $30.00. This will be a class judged show with each class limited to eight or fewer vehicles. Trained independent judges will examine the paint, body, interior and engine of your vehicle. A best of show car and a best of show truck will be awarded plus sponsor awards and a mayors award. Vehicles registered must be 1989 or older. Sign up on-line by clicking on the "REGISTER NOW" button. Thanks to our 1018 wonderful supporting sponsors listed below. Wood County Industrial Commission; Quitman Chamber of Commerce; Wood County Electric Cooperative; Quitman Dairy Queen; Seth's Lake Fork Creek Restaurant; Jackson Construction; Texas Farm Bureau; Peoples Telephone. contact Bud Hudgins bud_hudgins@yahoo.com 903-738-4921. no admission charge, free breakfast, music, 50-50 drawing. Low mileage, 305 V8 Original one owner For more information contact Fred Miller, 903-885-7621 Extension 5302 or 903-335-6777. 1950 Chevrolet C10 Resto-mod. 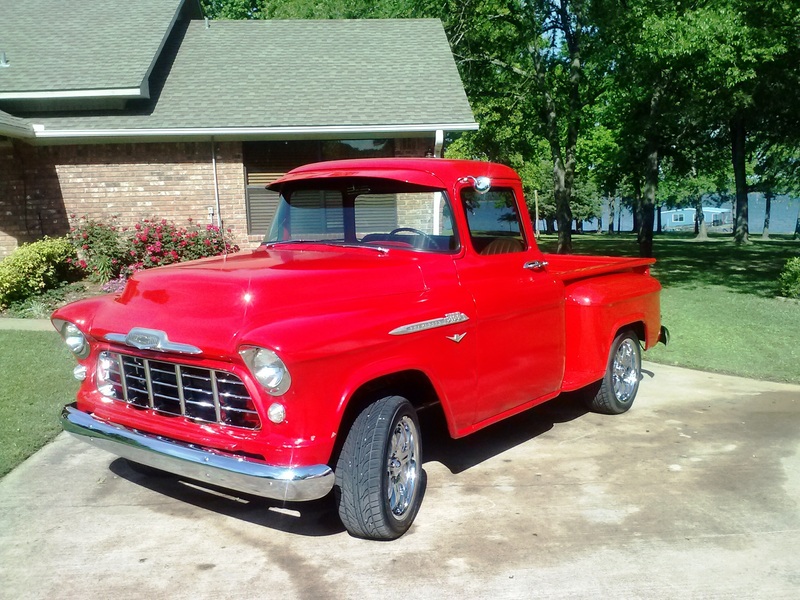 Complete frame-off restoration of a straight, one-owner truck! Restoration completed approximately 10 years ago utilizing a Chevy LT1 EFI engine with factory matched 4L60E automatic transmission and modern "Mustang 2" front end. Paint color: 1996 Cadillac Seville pearl white. Only 19,000 miles since built. Updated "Mustang 2" front end (better design), alignment and new tires (due to age not wear) last month. Asking $39,000. Contact Reggie Kennedy. 903-276-2356. Texarkana. Jim Skinner has a 1988 Silverado, new GM Air Conditioner, new radiator and heater hoses, automatic transmission, good michelin tires, am/fm, power locks and windows, light hail on roof. $3,500 cash, contact Jim Skinner 214-912-3959 or email jimskinner1950@gmail.com. 1969 Talladega, one of only 754 made 428 ci engine with C6 transmission, Texas car, 74000 miles, car is complete but needs paint, bumpers chromed, exhaust and interior, new black carpet. $33,000 contact Tim Timmons at lltimmons@aol.com or call 903-569-3443. Lake Country Classics is a North East Texas car club that seeks to bring together persons interested in cars and trucks especially vintage, classic, muscle and street rods. Our goal to promote a favorable public image and promote public interest through parades, car shows, and other community sponsored events. Regularly scheduled meetings are held on the third Monday each month.